Building a strong alliance is difficult business, as most companies know. While most alliances fail, those that prosper usually have a joint vision, clear and measurable objectives, a resource plan and method for sharing risk and reward. Prism’s decision support tools can help alliance partners build a joint strategic and business plan using an efficient alliance management process. But even before potential partners begin building a business plan, they need to understand concretely what business opportunities they could jointly pursue to mutual benefit. Because our group decision support tools can disaggregate votes by subgroup, Prism can accelerate early alliance scoping sessions where companies search for synergies they believe will result in joint gain. Imagine a scoping session involving a manufacturer and three of its suppliers. After brainstorming all possible alliance options, each management team uses Prism’s Group Decision Support System™ to assess these options on two axes: Revenue Potential and Willingness to Partner. 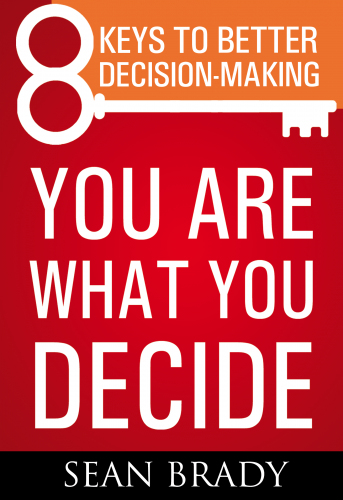 In the example above, the three options in the upper left-hand quadrant immediately appear worth pursuing. 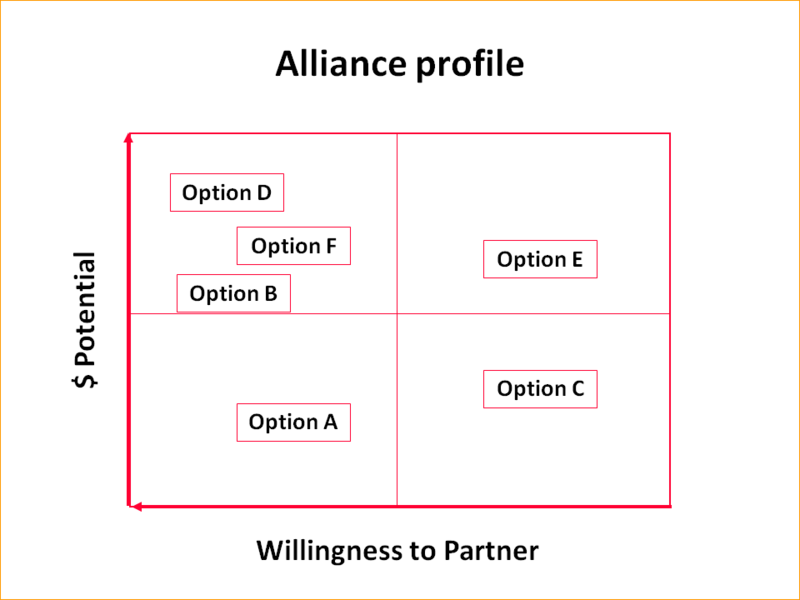 However, by digging a little deeper into the profile, the management teams can see how each company voted on each option, accelerating decisions regarding the most fertile partnering opportunities and combinations. 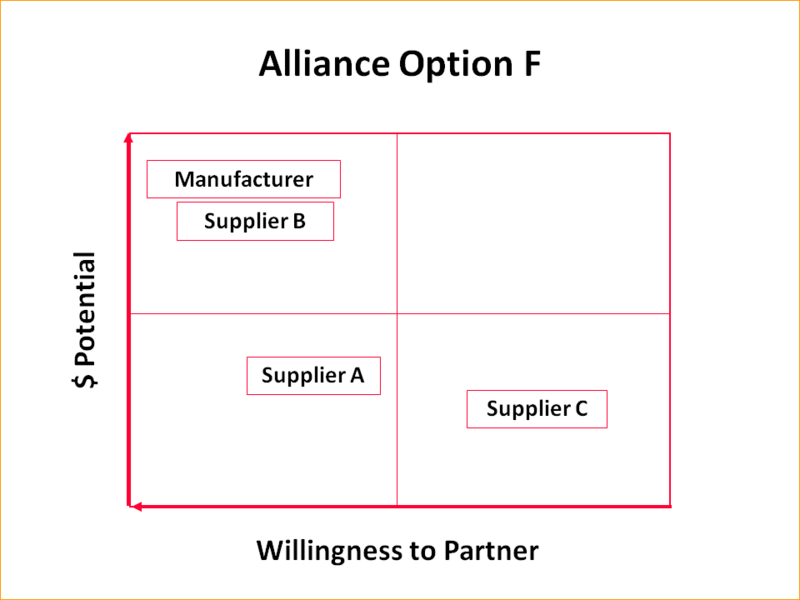 In the example above all four companies are interested in pursuing Option D. However, in the case of Option F below, only the manufacturer and one supplier have sufficient interest to proceed. 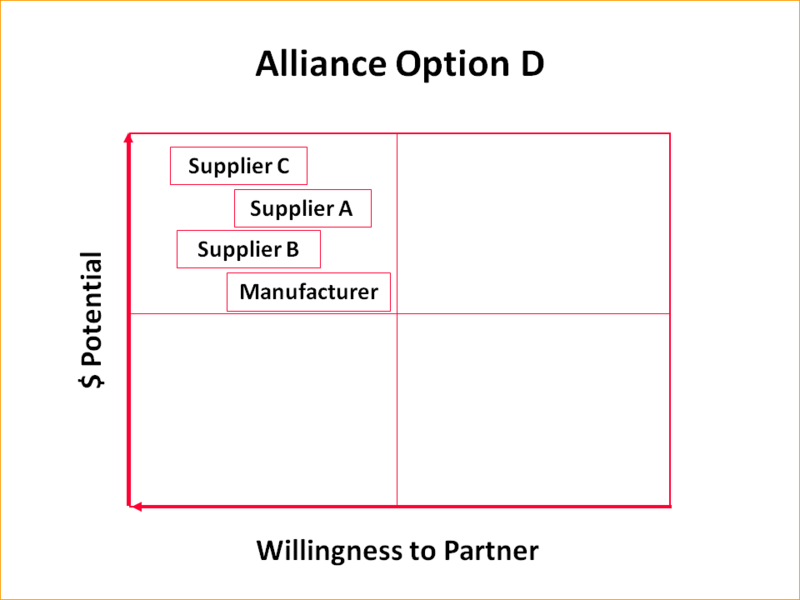 So while Suppliers A and C may participate in Option D they would not likely participate in Option F.
This visual display of each company’s willingness to pursue any one alliance option accelerates the alliance partners into substantive discussions on areas of real potential and eliminates the round-and-round discussions that often bog down in ego, turf and self-interest.